Every temperature-controlled transport operator is familiar with the following problem: while the refrigerated trailer is on the road, there is no efficient means of eliminating mould and bacteria that develop during the transport of a wide variety of different foodstuffs. These micro-organisms are permanently fed into and circulated around the vehicle superstructure by the refrigeration system. The new innovative Krone UV-C disinfection system now offers a solution to this problem. 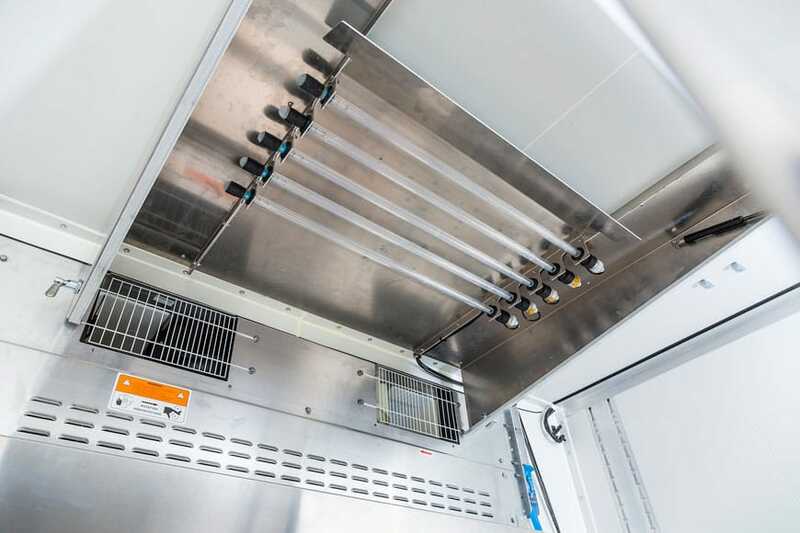 And this is how it works: The system consists of an air conduit hose with integrated UV-C lamps which is mounted in the vehicle superstructure where the cold air comes in from the refrigeration unit. . The incoming air is guided past the UV-C lamps thus drastically reducing the mould and bacterial load in the air due to the influence of the UV lamp. The air conduit housing can be adapted to all conventional cooling devices thanks to an adjustable guide plate. Operation of the system is comparatively simple. The system is supplied with energy via the refrigeration unit and is automatically activated when it is switched on and when the cooling device is in action. No time-consuming additional operations are required by the driver, and safety in loading and unloading cycles is ensured at all times. The efficiency of this innovative system was already documented in a study. By using the UV-C decontamination system, it was possible to reduce the development of mould by approx. 80 % and the bacterial load by up to 99 %. Conclusion: In addition to classical vehicle cleaning with water and chemical agents, the new UV-C disinfection from Krone ensures a significant reduction of mould and bacteria while on the road, and thus contributes substantially to improving food safety. Background: UV C rays have shorter wavelengths and higher energy than UV A and UV B rays. The high-energy UV C light triggers a photochemical reaction. Depending on the radiation dose, it kills the bacteria and fungal spores.